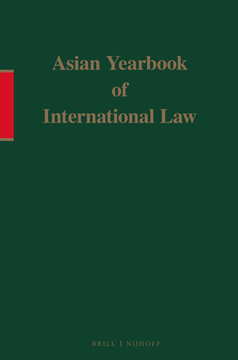 Launched in 1991, the Asian Yearbook of International Law is a major internationally-refereed yearbook dedicated to international legal issues as seen primarily from an Asian perspective. It is published by Brill under the auspices of the Foundation for the Development of International Law (DILA). When the Yearbook was launched, it was the first publication of its kind, edited by a team of leading international law scholars from across Asia. It provides a forum for the publication of articles in the field of international law, and other Asian international legal topics. The objects of the Yearbook are two-fold. First, to promote research, study and writing in the field of international law in Asia; and second, to provide an intellectual platform for the discussion and dissemination of Asian views and practices on contemporary international legal issues. Each volume of the Yearbook contains articles and shorter notes, a section on state practice, an overview of the Asian states’ participation in multilateral treaties and succinct analysis of recent international legal developments in Asia, as well as book reviews. This publication is important to anyone working on international law and in Asian studies. In keeping with DILA’s commitment to encouraging scholarship in international law as well as in disseminating such scholarship, its Governing Board decided to make the Yearbook open access and is available through Brill Open. Professor Seokwoo LEE of Inha University Law School, and Professor Hee Eun LEE of Handong International Law School, are the Co-Editors-in-Chief of the Yearbook commencing with the 2015 edition (volume 21).